the fluttering breast you longed to touch. It was not until much later that I found out that this is not simply an Irish tradition, but is one which occurs in Wales as well. I wanted to set up a dynamic between the bird and the woman in the poem. Whose fluttering breast is being touched, the bird’s or the woman’s? Who is cold? Who wants to touch who or what? There’ s also a funny sort of mixing and mingling between the I and the He and the bird. I cut the poem right back from a fourteen line poem to this seven lines, taking out the specific details of the story of its characters. In some ways I think of it as a half sonnet. In the service of its design it is without its second part; perhaps it is the equivalent of a piece of paper folding. If I think of ‘Burying the Wren’ as a poem which, little piece of origami that I have now made it, is in turn a little box, I like to think too that I am setting it up as a version of Shroedinger’s cat, the thought experiment devised by the physicist Erwin Shroedinger in the 1930s to illustrate an aspect of quantum theory called superposition. In this famous experiment an imaginary cat is placed in an imaginary box with an imaginary radioactive atom and some prussic acid. If even a small amount of the atomic matter decays then a hammer will be released, shattering the bottle in which the poison is kept, thus killing the cat. The theory of superposition suggests that since we really cannot know without opening the box, whether the cat is alive or dead, that the cat exists in a state of simultaneous aliveness and deadness. It is the observation of the cat that affects the outcome: it is only when we open the box that we can know one way or another. 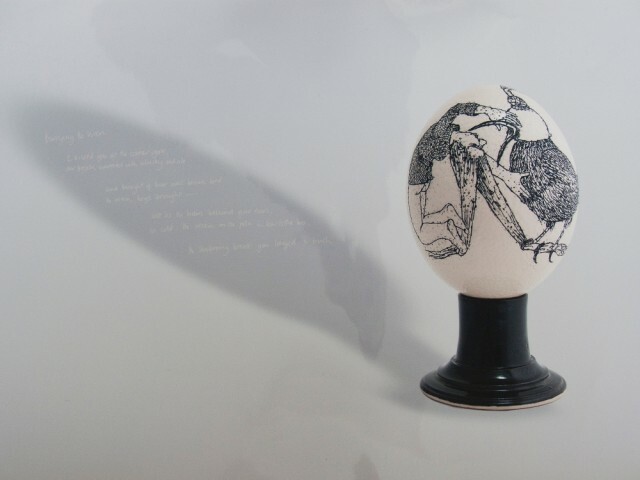 In response to this complex of associations, references and ideas, Alice Maher is drawn to the deep enigma of imagining eggs as ideal containers of the invisible, standing for the whole bird, for all birds, for potentiality itself. And on the surface, in the manner of Greek Attic vases, the line drawing depicts a large bird, nearly human size. Are they fighting, wrestling like ancient heroes? Is the bird about to swallow the figure, or the figure to wrench the bird’s neck? In its invisible contents, poised for eternity, the figures are posed in tension, in the visible unknowingness the artist and poet have given us. Alice Maher was educated at the Crawford College Cork, University of Ulster, and San Francisco Art Institute. Her first major solo show in Ireland, ‘familiar’ was presented at the Douglas Hyde Gallery in 1994. Other shows since include: Sao Paolo Biennale, Brazil; Natural Artifice, Brighton and Hove Museum (2007); and many others in France, USA, Finland and Portugal. Currently she is showing at Purdy Hicks, London (Godchildren). Deryn Rees-Jones' most recent poems are Falls & Finds (Shoestring, 2008). Seren has published three collections of her poems, including Signs Round a Dead Body (1998) and Quiver (2005). Her critical work includes a monograph on Carol Ann Duffy, and a book of essays Consorting with Angels>/i>. In 2010 she was given a Cholmondeley Award for achievement in poetry.